In a recent post, I discussed the possibility of getting too much protein in the diet, and possible side effects. I also shared the importance of getting enough protein, especially if you are over the age of forty, female, petite, and already over weight. So which is it? How do you know if you are getting either too much or too little protein? The answer is, and remains ~ you have to discover that for yourself! Our Hypercarnivore Diet is intentionally open-ended and flexible. How each responds to these slight nuances ~ the percentages of protein, fat, and carbs, whether eating plant foods or not, and if so, which types, and/or whether eating raw versus cooked, organs or no organs, etc. ~ will vary. Eating an animal-centered diet is essential, from our perspective, to ensure optimal nutrition through the ages. This has been shown by cultures around the world who maintained healthy dental carries, bones, immunity, and even fertility when they stuck to their traditional diets ~ all of which centered around animal foods. Learn more in The Hypercarnivore Diet, Don's new book, now available. 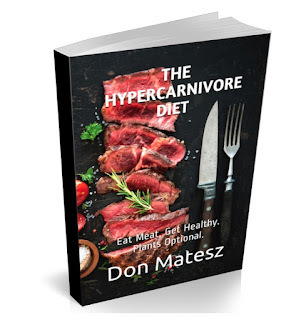 The Hypercarnivore Diet, NOW available on Amazon! However, he and I have differing needs, and as a result, our ranges of minimum to maximum total grams of protein and fat, or ratio of protein to fat where we each feel our best will reflect our individual physiologies, and needs. Even these will vary day to day, and over time, depending on our changing energetic requirements. Don seems to experience digestive issues if his diet gets too protein heavy, especially without either adequate levels of fat, sodium, and/or too little sleep! He will experience a slight queasiness, digestive stagnation, and watery stools ~ his tell-tale signs letting him know he consumed too many protein-heavy meals in a row. For example, he recently had over 600g of steak each of two days in a row, which may have been too much for him at once. (That was in addition to eggnog, or whatever we had at our first meal.) If we also happen to have disturbed sleep, he will then feel like his digestive system needs a break, so he fasts until hunger returns. So far, I've been reaching a near two to one (2:1) ratio of protein to fat without trying by virtue of our recent meal plan and timing. My macros have been averaging 150-165g of protein, and 80-90g of fat, with up to 50g of carbohydrates, primarily from whole milk, or whole milk products such as our homemade yogurt. If I do not consume enough fat, I simply crave more fat for a day, then tend to go back to craving higher-protein meals. If I happen to not stack my meals appropriately, I will have a little temporary upper abdominal fullness. I feel this way especially if I consume yogurt after my bigger, protein-rich meal. I feel better if I have the yogurt earlier, or post-meal if I eat my main meal early enough. Each person can discover what their optimal macronutrient amounts are directly through experience. You can test to find your ideal ranges of macronutrients simply by experimenting to find a range where you feel your best. Or, just pay attention to the subtle messages of your body ~ i.e., if you are craving more fat, have more. But if you keep craving fat, and are not having the desired results, cut back, and up your protein instead. Be patient, and trust your Self! If you want help discovering which foods will best help you thrive, take The Hypercarnivore Challenge! Or, click here learn more about the basics of what is included in The Hypercarnivore Diet, and why. My total calories have been ranging between mid-1500s to mid-1600s, on average. This is plenty for me. Considering I know I experience better health keeping my total carbohydrate intake to 50g or less, with few exceptions of going over that amount, the net result is seeming to be the 2:1 ratio of protein: fat. This still may change over time. I may enjoy some winter squash or tubers during the fall season, more fresh local fruits during the summer, all depending on my cravings, and local availability. Sunday's Slow-Roasting, Meal Prep Results. A big beef brisket, not shown. You can watch this in our recent Shopping Haul Plus Weekend Meal Prep, below. One whole, organic chicken, and two separate bone-in chicken breasts. and pink inside. Slow-Roasting is nearly fool-proof for roasting a variety of meats! Our meal timing has made a difference as well. Instead of trying to consume a protein-heavy, and calorie-heavy meal in the morning before heading to our office, we pack our main meal to go. We have an eggnog prior to leaving. Some days, if I feel I want more, I either have my coffee with heavy cream, or I also consume either some yogurt, or 25g of cheese, and a slice of turkey summer sausage or ham. The eggnog + little bit of fat and salty food combo holds me for hours. Again ~ this could NOT be easier!!! and/or if wanting higher fat, add 1-2 tbsp. heavy cream or if using, .5-1 tbsp. coconut oil. If I am out of milk, I sub a blend of ~ 1/4c+ half-and-half & coffee. We have been eating our main meal around 1:00, most days, typically finishing by 4:00 at the latest. However, if I ever feel the need, I will drink some milk with my eggshell calcium ~ either very cold and blended with cold water for a refreshing end to the day, or warmed, before bed. What are the benefits I am experiencing with this current hypercarnivore diet meal plan? It is so darn simple and easy!!! We do a little prep work over the weekend, roasting several items at one time. We mostly enjoy having our grilled steaks on the weekend, saving what we prepare on Sunday's for our work week. I have never experienced such freedom from cravings! I am not sure if it is just because I have been eating a hypercarnivore diet for over one year now, or I am getting all my needs met, and therefore want for nothing. But I am not even craving, desiring, or 'having to have' my tiny piece of 100% bakers chocolate post meals. Incredible!!! I practically don't want it, but if you were to offer...it would be rude to say no! Seriously, I have been forgetting I even have any. I have had at least 5-7g every day for almost the entire time up until our recent diet tweaks. I am feeling more energized eating higher protein to fat. I am able to eat enough calories to satisfy, without going over. I have no interest in, nor desire for making lots of high-fat 'keto' alternative foods, snacks, desserts, fat-bombs, keto brownies, like keto pizzas, keto breads, keto grilled cheese that are primarily made from fats ~ cheese, cream cheese, butter, and possibly eggs, and a little meat and/or almond or coconut flour. I think these can be enjoyable as an occasional treat, but they are not meant to be primary staple foods. Almond flour and coconut flour are not health foods with which to build a diet around. I will extrapolate on this in an upcoming post. The video below is a look at our recent hypercarnivore diet shopping haul, or carnivore diet shopping on a budget, and a look at our recent Sunday meal prep. We roasted a whole chicken, two separate bone-in chicken breasts, a leaner beef rump roast, and a huge brisket. We also made another batch of yogurt, and eggshell calcium. Both recipes can be found on the previous post, here. A Carnivore, or Hypercarnivore Diet, or even any variation of a low-carb and/or ketogenic diet need not be complicated. One of the greatest benefits is just how simple meal preparation can be! ...Here are few fun tools you could purchase to make your meal prep even faster and simpler, like a Hot Pot, pressure cooker, a grill pan, and/or a Hot Air Fryer, which people seem to be really enjoying. I think I'll put that one on our wish list! Just prepare some slow roasted meats ~ beef, chicken, turkey breast, or whatever you like ~ and you will have easy meals all week. I've got my eye on the Red GoWise, made in the USA 3.7 quart size for Don and I! By the way, we are using a Presto Pressure Cooker, shown below for our Pressure Cooked Bone Broth.